The 9 Best IT Cosmetics Products. As much as I adore trying new beauty products, I'm also extremely loyal to my "tried and trues". I made a pretty big Ulta haul this week (Because #SOS there are no Ulta stores in Vermont so gotta stock up now! ), and after getting home I realized that everything I bought was a replacement for a product that I've already used and loved. Sometimes you just have to stay true to what you love! With all that said, I do get so excited when I try a new beauty product and fall head over heels for it, and know that it will be apart of my daily routine. Even better (and rarer!) is when I try a whole new line and fall in love with just about everything. That's exactly what happened with me and IT Cosmetics last year! I had heard of IT previously, but had never tried any of their products. 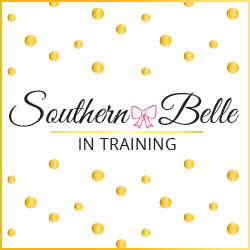 They were a sponsor at last summer's Blog Societies conference which I attended in Charleston, so I had the opportunity to meet members of their PR team and learn about the products firsthand. I came home with tons of products to try from their Bye Bye line, which was just about to debut at Sephora, and blown away by what I found after testing everything! Throughout this past year I've had the chance to try a lot more IT Cosmetics products, and I've fallen in love with many. The nine that I have featured in this post are now considered among my absolute ride or die beauty products, and I use them everyday that I wear a full face of makeup. 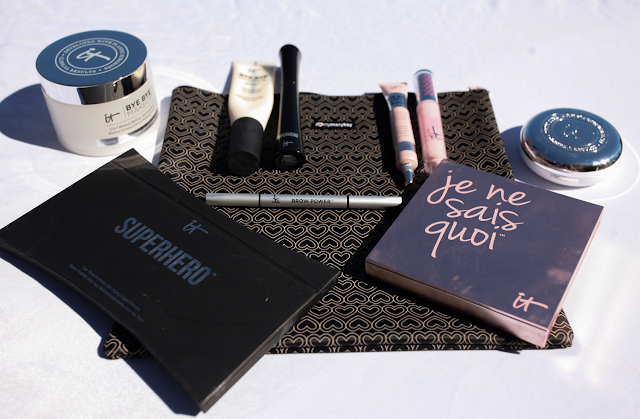 *Superhero Volumizing Mascara - Like most girls, I love my mascara and am picky about which ones I like. I love the look of super dramatic lashes for everyday wear, basically I always want to look like I have false lashes on. 😉 I wear mascara primer and usually layer three different mascaras for my daily makeup routine- true story! This mascara pleasantly surprised me, and has become my #2 layer mascara, as it builds and lengthens really well. It's also awesome to wear on days when I don't do full makeup and just wear one mascara for a little bit of something. One note about this mascara- the tube is very messy. The product frequently smears out of the tube and all over it and onto my hands, which doesn't happen a lot with my other mascaras?! But it doesn't actually affect how it is on my eyes so therefore I'd keep wearing it! *Superhero Eyeshadow Palette - This palette is actually sold out right now, but I linked to it anyways so that y'all can purchase it and bookmark it should it come back in stock. IT Cosmetics sent this to all of the bloggers who went to TBS Con a little bit before the conference, and I actually brought mine with me to Charleston since I liked it so much! I think it's what I've been wearing in most of my recent blog shoots also. This is an ideal eyeshadow palette because it's great for both everyday wear and fun nighttime looks as well. The eyeshadows last all day as long as you wear eyeshadow primer under them (this is my favorite primer). *Je Ne Sais Quoi Complexion Perfection Palette - One of my favorite IT Cosmetics products!! This great palette is perfect for contouring and highlighting. It has a universally flattering bronzer, highlighter, blush and setting powder. LOVE this palette and would recommend it to anyone! *Confidence in a Compact (SPF 50) - Out of everything I've tried from IT, this item surprised me the most and I absolutely adore it! This is a compact creme foundation- I'd never really used anything like this before. I've been blessed to generally have really great facial skin, but despite that, I've always preferred high coverage liquid foundation. I love makeup and really like wearing a "made up" look. So in the past I've never worn an compact foundations. But oh my gosh this product absolutely blew me away. It blends SO naturally with my skin (I wear shade "Light"), and gave me a perfect everyday look. I actually brought this to Italy instead of my liquid foundation since it was one less thing for my liquids bag on the plane, and it was a dream to fly and travel with. It's not the highest coverage foundation, but it makes me feel like my skin can breath a bit more while wearing it. I have tried the uber popular IT Cosmetics CC Cream before, but absolutely prefer this product to that. *Brow Power Universal Brow Pencil - If I could only use one makeup product ever, it would be an eyebrow pencil. My eyebrows are actually my feature that I'm most insecure about- they're very full and bushy but also not super filled in if that makes sense. Everyday I fill them in with a pencil and shape them with gel to try and get them how I like. Previously I was using a drugstore pencil that was under $5 which I did like a lot, so it would take a lot for me to switch to something that was more money. But goodness- one try of this pencil and I was hooked! It's just great! I still go back and forth between this and my drugstore pencil but this one is real good. *Bye Bye Under Eye Illumination Concealer - This concealer is good stuff!! I wish I had known about this concealer at this time two years ago when I was taking History of Journalism, aka the hardest class that I took in college, and the reason that I didn't get more than four hours of sleep most weeknights during spring semester of junior year. This product would have covered up all of the dark circles from late nights of paper writing! Seriously though, this concealer can cover up anything. A little goes a LONG way- I only have to use the tiniest amount. It actually works so well that it's not my everyday concealer, but I always reach for this if I have extra dark circles or a bad zit to cover up. *Bye Bye Makeup Melting Cleansing Balm - This is probably one of my most favorite IT Cosmetics products! Good makeup removers are so hard to find- am I right? Especially finding ones that can take off waterproof eye makeup. This cleansing balm is absolutely amazing- you just rub a little bit on your eyes and face, follow up with a tissue, and then wash your face as normal, and the makeup is 100% gone! I've never seen anything that works so well. It is very pricy, but totally worth it in my opinion (and it lasts forever). *Bye Bye Pores Primer - A great and lightweight foundation primer that gets the job done! I don't wear this every single day, but I usually wear it before blog photoshoots or going out/special occasions when my makeup is heavier. *Vitality Blush Hydrating Gloss Stain (Shade: Je Ne Sais Quoi) - Fact about me: I am an eye makeup girl and not a lip girl. That doesn't mean that I don't have an enormous lipstick collection, but it just means that eyeshadows and mascaras will always be my main weakness, and that I never feel ready until my eye makeup is done, not my lips. Many days I actually forget to put lipstick on #badfashionblogger. However- I'm still 10000x more likely to wear lipstick than lip gloss! Blame it on the fact that I have really long hair, but most lip glosses are so sticky and get caught in either my hair, food, or other things. No thanks! Good news though: The Vitality Blush Hydrating Gloss Stains are changing my perspective on lip glosses! I've been wearing this all the time, and it's fairly non sticky and looks so beautiful naturally on my lips or layered over lipstick. So there you have it- my favorite IT Cosmetics products! Have you tried anything from this brand before? If so, what are your favorites? And please give me feedback on if you liked this type of blog post! Since my reader survey I have been trying to integrate more beauty content into my blog as well, but I want to make sure that y'all like these types of posts. I loveeee makeup hauls, they are so fun! Great bunch of products you got, I've never personally tried any of them, but a few seem to appeal to me so I'll be trying the brow pencil! The confidence in a compact and mascara are my favorites! 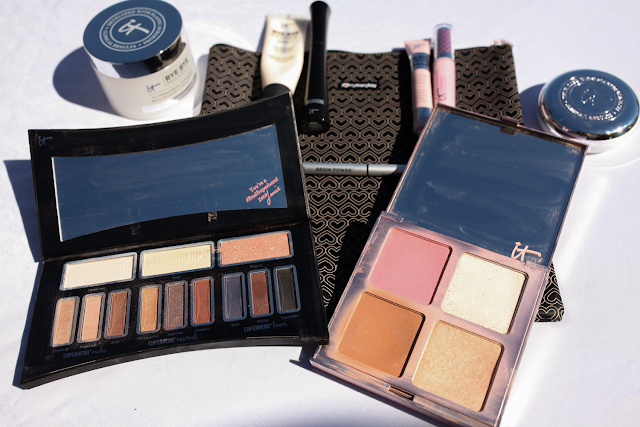 I love IT Cosmetics, they have the best products! Huge fan of IT!! i'll face to try their mascara! I don't have any IT Cosmetics makeup, but I do have some brushes from them that I love! Ohh these look good! I have to try IT cosmetics. I should really try some of these beauty products. You picked all of my favorites! It Cosmetics is such a great company with great products! I totally need to try IT cosmetics! I've heard SO many good things! I love IT cosmetics and this is a great list! I haven't tried all of these products but I do like the IT Cosmetics bye bye undereye and love it. Great items, I agree these are all fantastic! I have tried all but the brow pencil. In short the association can properly watch out for the nature organic aloe vera of the shabby cosmetics being delivered. Mint and Pink For Spring. Relationship Monday: What I Look For In A Guy. Palm Trees + Paisley Dress. All About The New LiketoKnow.It App! BIG NEWS: I Have a Radio Job + I'm Moving!!!! The BEST Off-the-Shoulder Top For Spring!